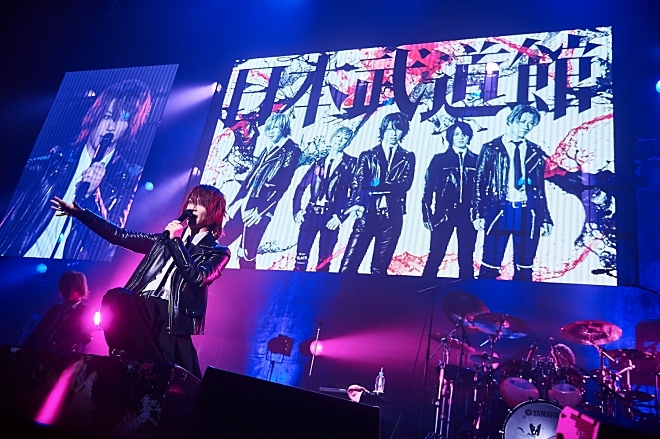 LIVE REPORT: SuG VersuS 2016 EXTRA @ Toyosu Pit | VKH Press – J-Rock & Visual Kei Coverage Worldwide! After touring across the country as their alter-egos Heinous (Gokuaku) SuG and Colored (Gokusai) SuG, the band returned to Toyosu Pit for a final battle and an exciting end to the year. 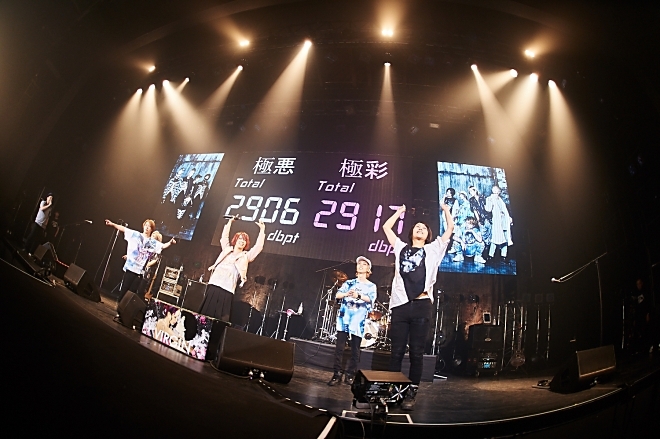 Their two alter egos had fought long and hard and the results of the VersuS Tour was Heinous SuG with 2,681 decibel points (dbpt) and Colored SuG with 2,682 dbpts. With scores that close, there needed to be a tie breaker. The show began when the VersuS fight music boomed through the speakers and the crowd shifted in anticipation, clapping to the beat. The referee for the night came out on stage and welcomed everyone to the match. He quickly explained the rules: each side would perform and during their set, there would be a chance for the crowd to scream their support as loud as possible. The decibel meters on either side of the stage would measure the volume and the decibel points would be the score. They would be added to the previous scores, choosing the winner once and for all. Once the crowd was prepared, the promotional video for the VersuS tour played on the screen overhead, getting the crowd screaming excitedly. Heinous SuG were the first to take the stage. Clad in all black with determination stamped across their faces and looking ready to go all out. They kicked off their set with the aggressive “KILL KILL”. The room lit up with flashing red lights and the crowd pumped their fists in the air then flashed their middle fingers, in sync with the rebellious atmosphere. Not satisfied with the energy just yet, the band paused the music and moved around the stage getting the crowd even more riled up. There was a catwalk-style platform that protruded into the audience so they could get as close as possible to the fans. They immediately followed with “FLY WYVERNS” and Masato and Yuji’s catchy riffs had the crowd rocking out. The video overhead showed guys playing basketball. “BLOODY MARY” was right after and the accompanying video was a compilation of old-school horror movies and black and white cartoons that gave the performance a creepy yet quirky atmosphere. The energy was a bit more subdued but the crowd never stopped moving. Takeru put more focus into his voice then stepped onto the catwalk during the instrumental break to show off his dance skills. “sweeToxic” had SuG and their fans moving in perfect sync, jumping and clapping in time to the slightly jazzy vibe of the song. After that, the band paused and the lights dimmed, prompting the crowd to cheer and scream the members’ names. The referee returned and got the crowd ready to give their judgement. They did not disappoint and the decibel meter registered their screams as 109 dbpts. The referee gave Masato, Chiyu and Yuji a chance to talk and they praised the crowd for their enthusiasm, getting them even more excited with a call and response. Yuji was using his growling “Heinous” voice, which made him sound like a cartoon villain and had the crowd laughing in spite of themselves. “UMBILICAL” slowed the pace and lit up the venue in a swirl of pretty pink and red lights. The guitar riffs and scales were particularly prominent and Takeru stood at the center of the stage pouring even more emotions into his vocals. Even as Heinous SuG, they could deliver beautiful ballads that kept the crowd riveted in place. That quiet didn’t last for long however. With a quick count from Shinpei, the venue burst to life once again with the ever-so-catchy “Pimp My Cars”. Hands shot into the air as everyone waved and bounced to the beat. The band were all moving to the music, wiggling their hips as the bass thrummed and the melody became a bit more sultry. The lights dimmed and then the video overhead lit up. 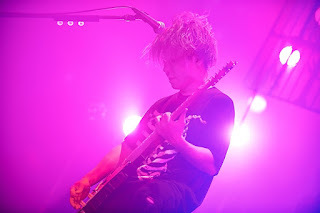 Takeru had left the stage and it was time for the Colored SuG vs Heinous SuG instrumental battle. 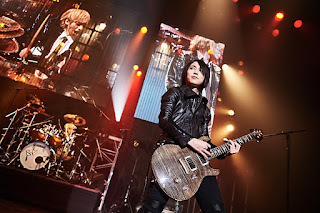 It started with Shinpei whose lighter alter-ego began playing on the video followed by Chiyu, Yuji and Masato. Then they all stopped to to taunt and jeer at Heinous SuG who took that as their cue to go all out, spurred on by the cheers of the crowd. As Shinpei continued to pound away on the drums, Masato, Yuji and Chiyu jumped onto the platform on stage, going all out and claiming this round as their victory. With the crowd all pumped up, Takeru returned to the stage saying in English, “The next one is called, ‘SCREAM IT LOUDER’”. By now, the energy in the room was the highest it had been all night and the audience were singing as loudly as they could. Takeru did his rap on the platform, then he initiated a call and response with the crowd, keeping them engaged till the end. Masato opened “ZIG ZAG” and the big band style sound had the crowd jumping and clearly having fun. The members couldn’t keep the smiles off their faces either. It wasn’t very heinous but no-one seemed to mind at that point. “heavy+electro+dance+punk” had the crowd throwing themselves forward to headbang to the heavy riffs while red lights flashed rapidly around them. The members all screamed and riled up the audience who started chanting aggressively in response. When it was over, the crowd kept their arms stretched towards the stage, as if begging the band for more. 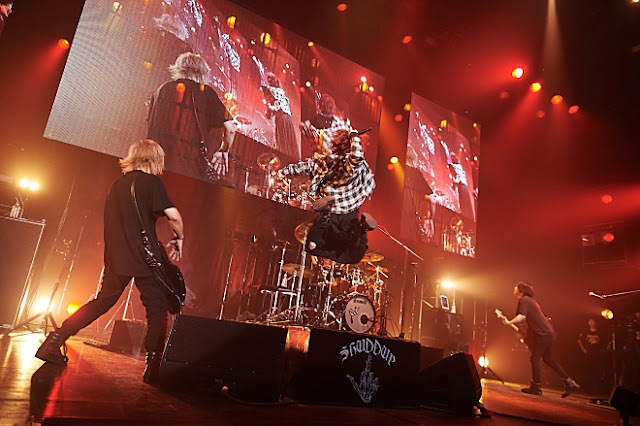 The decibel meter measured the final scream of the crowd (keeping the results a secret until the end) then Heinous SuG did a final jump, leaving the stage to lingering applause. While the band was preparing their alter egos for the second round, the referee returned to keep the crowd amused and entertained so the time passed quickly. Then the video screen lit up again showing clips from all the VersuS battles over the years. Then it switched backstage to Heinous SuG who had just left the stage, still looking dark and intimidating. 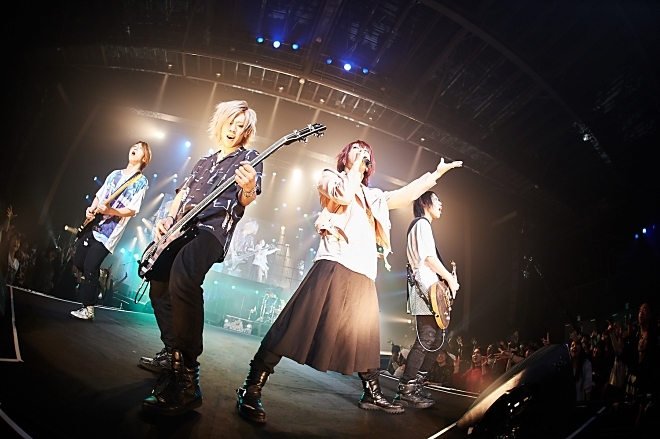 Then the camera changed to Colored SuG who were ready to take the stage and show the audience what they were made of. The album art for VIRGIN popped up on the screen and then the screams started as Colored SuG came through the audience, high-fiving the crowd as they made their way to the stage. They started with “SICK’S” that brought the room to life, followed by “FRIDAY!!”. Multicolored lights flashed across the stage and the crowd was jumping to the poppy beat. The members of Colored SuG were all smiles as they continued to encourage the crowd’s participation. The band and the fans all got down to headbanging and dancing for “Fast Food Hunters”. Chiyu strutted onto the catwalk, jamming out during his bass solo. 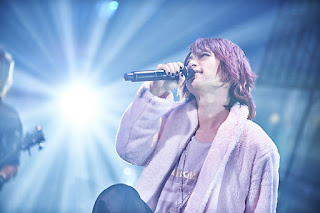 “CRY OUT” took on a more emotional tone with pure white spotlights that bracketed Takeru as he sang. The words of the chorus was splashed across the screen so the audience could sing along. Takeru whispered “Thank you” at the end, prompting the crowd to launch into screams and cheers. On that cue, the referee returned to measure up the first set of cheers for Colored SuG. The results were a whopping 114 dbpts and the members’ mouths all dropped open in shock. They were off to an amazing start. Shinpei thanked the crowd and then Takeru got them raring to go again with a call and response. 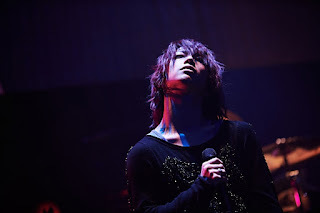 It was time for round 2 and Takeru asked the crowd to listen carefully as the band continued with “Sakura-Ame”. The lights were soft this time and the video overhead showed clips of glass shattering slowly. The audience in the room kept still and the band’s instruments sounded rich in the silence. 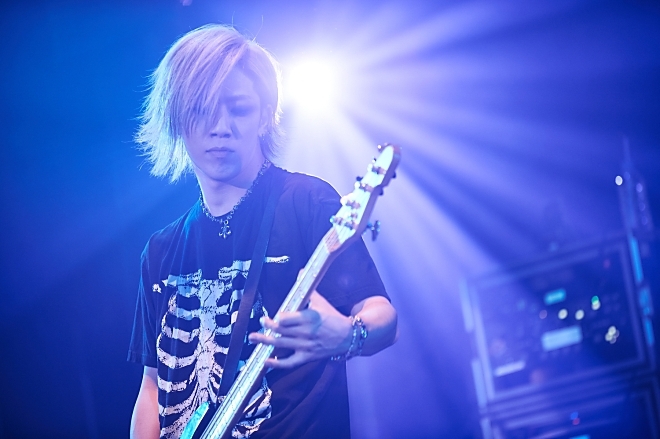 During the bridge, the spotlight shone over Takeru, shifting the focus to him as he kept his voice soft but strong. The song ended and the silence lingered. In the near-dark of the room, “teenAge dream” began. Blue and purple lights flooded the stage then they switched to spotlights over each member. Although there wasn’t much movement, Takeru urged the crowd to sing with him and soon the room was filled with everyone’s voices. He knelt on the stage as the music built to the final chorus. The song ended and the lights faded. When the stage lit up once again, Takeru was gone and the rest of Colored SuG were getting ready for their faceoff. 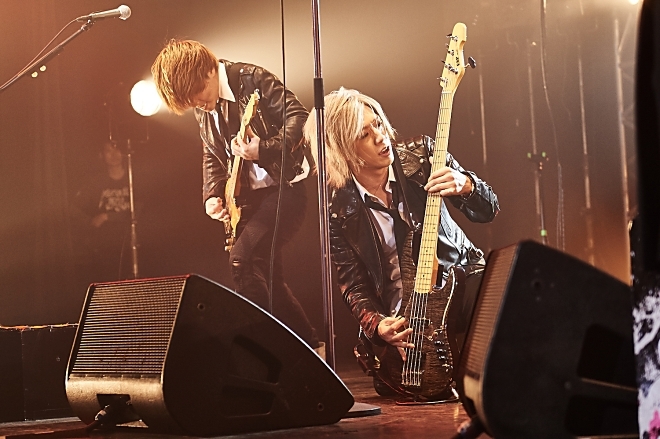 Like before, their dark alter-egos on screen went first, then Colored SuG fought back. 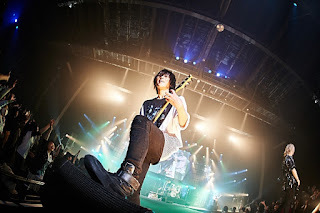 Rather than focussing on hard riffs like their dark counterparts, the members all moved around the stage, jamming out and encouraging the crowd to rock with them. The result was alot more fun than before. Takeru returned and the hyper energy continued with “Vi-Vi-Vi”. Then the band started playing round after round of riffs as everyone waved their towels frantically in the air. They followed immediately with “Mugen Styles” which was a ton of fun and continued to build on the previous energy until the room was practically buzzing with movement. Takeru, Yuji and Chiyu showed off their rap skills for the beginning of “Shanghai Honey”. The crowd was waving along and all the members save for Shinpei moved to the catwalk and headbanged together. 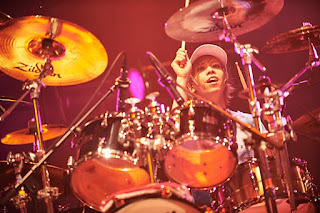 Not to be left out, Shinpei continued to go hard on the drums, keeping the crowd jumping along. All too soon, Takeru was announcing that the next song was the last. “Koakuma Sparkling” was the perfect end to Colored SuG’s set. The crowd continued to match the band’s exuberance: jumping, waving and headbanging without ever losing their energy. Colored SuG were all dancing as well, making silly faces and having fun. They finished with a cute dance break and then the decibel meter measured the final scream. The band did a final jump and then the referee came out to announce the final results. It was a close race but the final scores were Heinous SuG with 2,906 dbpts and Colored SuG with 2917 dbpts making them the winner. The band thanked the crowd who cheered in support and chanted for more VersuS lives in the future. It was clearly a success. Colored SuG got to perform their victory song which was “B.A.B.Y”. They kicked off the song with a jump in unison and Takeru launched so high into the air that he hit the ground rolling. The band let loose even more, pulling the crowd along for a final wild performance. Then he thanked everyone again and the band left the stage. Without a moment's pause, the audience started chanting for an encore. Instead of the band however, a video began to play. It was filmed in a documentary style showed all the members talking about their reason for starting SuG and some of the difficulties they’ve faced thus far. The crowd was perfectly still, watching the video intently and wondering what the band was planning. The crowd began applauding as the tension broke and they cheered for the band and their milestone. This year marked their 10 year anniversary and they were going to release a new album along with a tour, culminating at Budokan. With the news out in the open, the band continued their encore with “gr8 story” and the final song of the night “Smells Like Virgin Spirit”. As proof of their new determination and self-confidence, the band gave the crowd permission to film the final performance and take pictures. They were even allowed to share it on social media so the whole world could see the fighting spirit of SuG.